Police in Colombia say the body of a man from Bristol who died after taking part in a tribal ritual had been "abandoned" on a remote forest road. Henry Miller, 19, died after apparently consuming a traditional hallucinogenic drink known as yage. Police said two men on a motorcycle tried to take Mr Miller to hospital when he became ill, but he died on the way and they left him at the roadside. 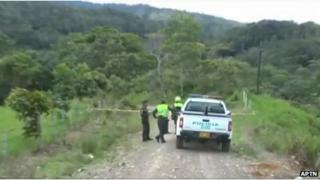 Colombian authorities said the cause of death was "not definitely established". Police commander Ricardo Suarez said: "The first hypothesis is an excessive consumption of this traditional drink - yage - native to indigenous communities." He said Mr Miller's health deteriorated following the drink and a local shaman in the Putumayo region sent him off for medical help. The indigenous tribe involved in the ritual and the "two frightened young men" who left the body had now been identified, said the Putumayo police commander. Mr Miller's parents David and Elizabeth Miller paid tribute to their son, who was due to start university in September. In a statement, they said: "He was polite, popular with a great sense of humour and was very much loved by his family and his many friends. They said they understood their son's reaction to the drink made from local plant infusions was "likely" to be the cause of his death, but they were awaiting further information from the Foreign Office.